Rather then telling a story, the book tells about how the girls umbrella makes her feel, what she can do with it, and how it is perfect even though it isn't raining. Even in her dreams, her umbrella goes with her on journeys. The words are lovely, but the pictures truly say it all! For the most part each whimsical picture is a single color palette with the exception of the girl, her dog, and her yellow umbrella. This makes for a striking contrast bringing out the girls feelings for her umbrella while evoking your own pleasant feelings. I read the book to the kids and then asked them to show me their favorite parts and what they liked about the book and the color yellow. They each had their own favorite page, but they all agreed the color yellow was warm and fun and the book made them happy. 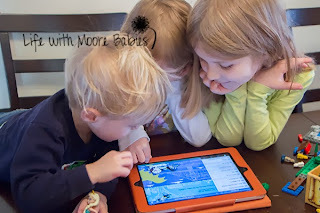 They spent a lot of time just scrolling through the pictures! Overall the book is simply adorable. 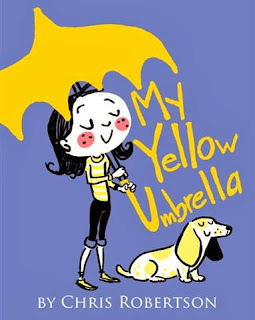 Chris has generously allowed me to give 1 copy of his ebook My Yellow Umbrella to one of my lovely readers! Want to go ahead and purchase the book? Head over to Amazon. To see more of Chris's work visit his website, Chris Robertson Books, or follow him on facebook or twitter!